So, the title is a little disingenuous. My dream cottage would be located on the ocean. Somehow "lake cottage" is a bit more evocative of a certain style, though. It's a little cozier than an oceanfront home: a little more collected, a little less nautical. 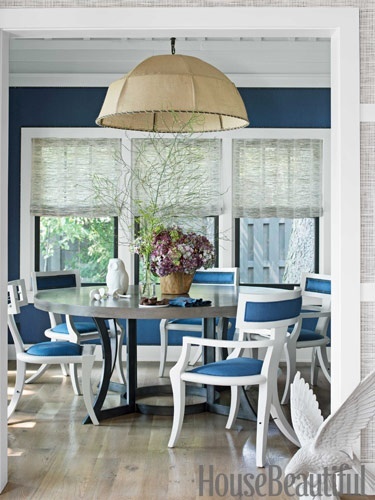 I love that these walls and chairs bring big design points to an otherwise sparse room. The upholstered walls create warmth, but Thom said he added them to muffle the raucous sounds of his loud dinner parties. But overall, I just love that jewel-toned blue. 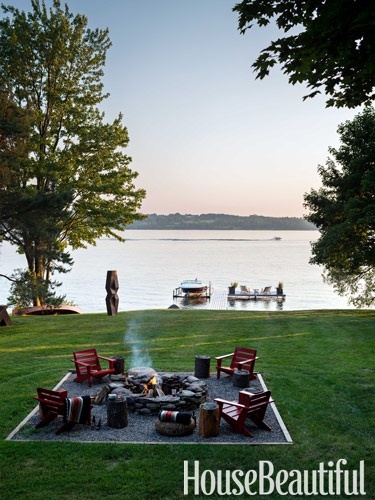 This fire pit feels totally at home for summer evenings or fall afternoons... Big Pemberton blankets for everyone and a steaming cup of hot cider... yes, please. Now for some elements I would bring to the house. 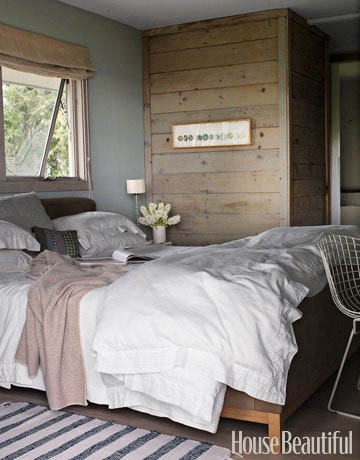 First, a cozy, tranquil bedroom. It is feminine for sure, but not overly so. I always love a big, fluffy duvet - it looks so welcoming (summer or fall), and keeping the look rather monochromatic reminds me of a posh hotel suite. That unfinished wall finishes the look for me, bringing the outdoors in, in a really polished way. Next, a bright, utilitarian kitchen. Cooking on vacation isn't the number one priority, and this kitchen houses the necessities. 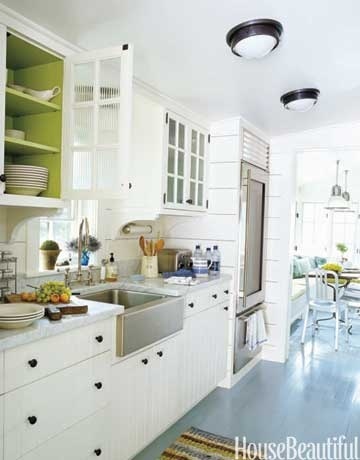 I love the pop of apple green inside the upper cabinets. It's something you might not do at home for fear you wouldn't like it for the long haul, but the whimsy works here. Love the fire pit! Maybe we should do gravel around ours ... really looks sharp but still natural.